Way back in those good old days, doctors used to send patients with breathing problems out here for the clean, dry air. It's been a long time since they've done that. There's always something in bloom here in Phoenix. If you're riddled with allergies, it's not always the best place to visit-- especially when the wind blows like it did today. Most of my allergies are caused by things that do not grow in the desert, but on those days when the air is chockful of pollen, my nose decides not to differentiate. There was a period of time this morning when I thought I was about to sneeze myself into an alternate universe. Zounds! Did I hide indoors? Of course not! I took a pill, got my camera, and Denis and I had a lovely, lovely afternoon at the Desert Botanical Garden where blooming swaths of the landscape looked like Impressionist paintings, and the air was filled with the chatter of visitors from all over the world. 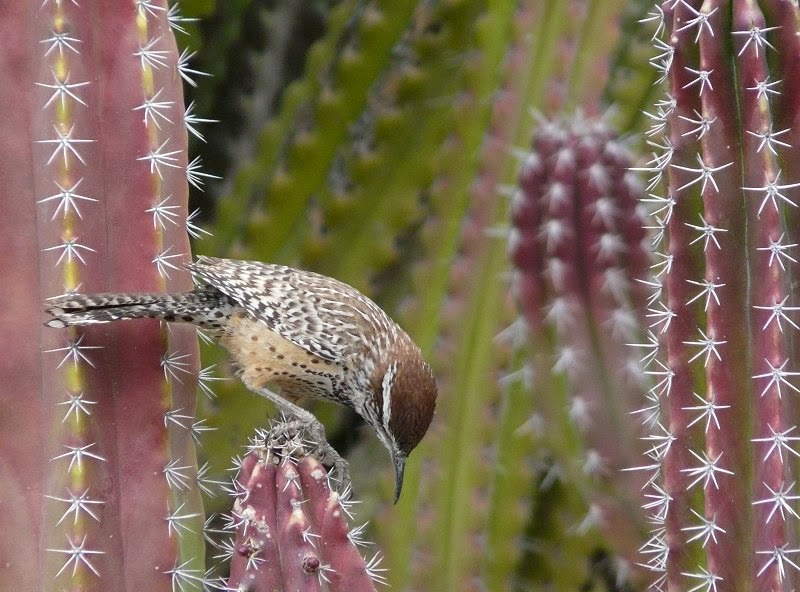 We also saw tons of wildlife, like Arizona's state bird, the cactus wren, who's busily picking bugs off a cactus in this photo. I took a lot more photographs, but those will be for another post sometime next week. 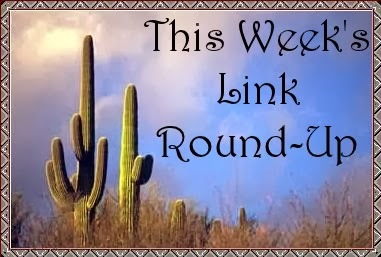 In the mean time, I'd better mosey over and rustle up some links for you folks! In a "what was she thinking???" moment, author Lynn Shepherd says J.K. Rowling has had her turn and should stop writing. Yikes! From beyond the grave, Stieg Larsson names his suspect in the murder of Swedish prime minister Olof Palme. How did computers uncover J.K. Rowling's pseudonym? A fantastic astronomy photo of the day showing the aurora over New Zealand. For the first time, there are less than a thousand independent bookshops in the UK. Socorro Ramos will be 91 this year, and she still goes in everyday to run her bookstore. Speaking of J.K. Rowling once again, she's planning an entire series of crime novels to follow The Cuckoo's Calling. Amtrak has a plan to give free rides to writers. There is an amazing village in The Netherlands designed just for people with dementia. Want your money to do as much good as it possibly can? Don't donate it to fancy colleges. I think my husband's favorite film is The Sound of Music. This week, the last of the original Von Trapp Family Singers, Maria von Trapp, died at the age of 99 in Vermont. A short Youtube video called Ranting about Books that hits several of my own pet peeves. Whether you have one blog reader or ten or one hundred or... here's why you're a big deal. With bits of wire and paperback books, here's a slideshow of an artist's homage to the book. 46 rooms starring IKEA's discontinued EXPEDIT shelves. Archaeologists recreate a Roman gladiator school in Austria. Fossils reveal the first evidence of mass marine die-offs. Could Wales' lost kingdom under the sea really have existed? The source of Stonehenge's bluestone rocks has been identified. A record-breaking meteorite crash on the moon sparks the brightest lunar explosion ever. A priceless dinosaur track near Moab, Utah, has been stolen. You can take a look at the Great Lakes from space and see how cold this winter has been. Brrrrrrrrrrr! Silver hoop earrings have been found among ancient treasure in a biblical city in Israel. 10 words in the mysterious Voynich Manuscript have been decoded. 14 compelling female characters who need their own spin-off novels. The 10 most dangerous (and safest) countries for driving. 30 book covers that need to be stopped. 25 things you had no idea there were words for. These 8 female characters deserve their own books. I remember when doctors used to send patients to the desert. I love your photo! I seldom ever have to wrassle with allergies, so I know how lucky I am!